The DV-HD805B maximizes the potential of HD DVD by packing in key technologies that will take high-definition HD DVD content to its full potential. There's high-bit-rate streaming of Dolby TrueHD and DTS-HD Master Audio, as well as the groundbreaking precision of HQV Reon-VX video processing. And that's just the beginning. February 19, 2008 may have spelled the end for HD DVD - on that day, Toshiba announced that it would no longer develop, manufacturer, or market this hi-def video format - but it's not the end for HD DVD players. In fact, it's a new day for your DVD library. While you can enjoy any HD DVD titles released before this announcement, you can also see your standard DVDs like never before with an HD DVD player. How, you might ask? One word: upconversion. Your DVD collection delivers lower-resolution (480i) video content while your huge flat-panel HDTV is capable of displaying a high-definition 1080i or 1080p resolution. Video upconversion enhances lower-resolution video content, by means of a technique known as interpolation, so that it displays at high-definition on your HDTV. 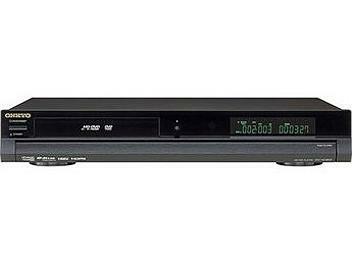 So, investing in a DV-HD805B HD DVD player means investing in better performance from the media you already have. Onkyo's debut HD DVD player has definitely been worth the wait. While other companies' first-generation players offered limited capabilities, due to lack of high-definition surround-sound codecs, ineffective digital connectivity and a scarcity of content, the DVHD805 HD DVD player packs the key technologies that will take high-definition HD DVD content to its full potential. This player is one of the first to handle high-bit-rate streaming of Dolby TrueHD and DTS-HD Master Audio, as well as groundbreaking precision of HQV Reon-VX video processing. Serving as the ideal foal for Onkyo's acclaimed high definition-ready A/V receivers, the DVHD805 is perfectly timed to deliver on the promise of high-definition home entertainment. HD DVD discs enable delivery of the highest possible video resolution, 1080p. Unlike earlier HD DVD players, the DVHD805 has the capability to support different frame rates, including playback at 24 frames per second, the native frame rate of the original sources for most high-def content. This means you can experience films recorded to HD DVD with the smoothest, most stable reproduction possible. Dolby TrueHD is the mandatory high-resolution audio format for HD DVD. The DVHD805 features an onboard Dolby TrueHD decoder (which also covers Dolby Digital Plus and any other Dolby Digital format) to give you the same quality of surround sound as in the studio master. You're getting bit-for-bit audio reproduction, for exceptional clarity and realism from movie soundtracks. Unlike the majority of HD DVD players currently on the market, the DVHD805 incorporates the latest version of the HDMI specification. HDMI version 1.3a enables the transport of full high-definition audio and video. Without it, the DVHD805 would not be able to match the potential of high-definition 1080p video with high-bit-rate audio streaming. Furthermore, HDMI 1.3a will enable the future benefits of Deep Color technology, which improves color tones and achieves finer color gradation. HDMI 1.3a also supports the xvYCC extended color gamut and improved lip-sync capabilities. Recognized as the leading video processing technology in the home theater industry, the HQV Reon-VX video processing chipset upscales standard-definition discs to 720p, 1080i or 1080p. This means your standard-definition DVDs can be played with enhanced quality at the native resolution of the connected high-definition display. This technology also eliminates, or substantially reduces, video noise from HD DVD discs for improved video reproduction. The Analog Devices 297 MHz/12-bit video DAC uses 4x oversampling to support the playback of DVD video over component video outputs. You can expect pristine clarity and vibrant realism from video sources. Meanwhile, the accompanying SHARC DSP (Digital Signal Processing) device brings wider dynamic range to the DVHD805's performance. The DVHD805's audio and video output terminals (component video, s-video, composite video, 5.1-multichannel audio, 2-channel audio and digital coaxial) are all gold-plated to preserve the quality of the respective signals. An RS232 port enables connection with home automation systems. The Ethernet port provides access to web-enabled content, such as additional scenes and bonus features.